All received manuscripts are initially scrutinized on the basis of research paper format. If found suitable, article is further referred to a reviewer for double blind review process. Identity of author/s is not disclosed to the reviewer and vice-versa. On feedback from reviewer, editor analyze the feedback and decides to accept, reject or revise the paper. Normally double blind peer review process takes around 10 to 15 days to provide feedback to authors. If paper is accepted, we will send acceptance latter to author. The Journal reserves the right to make necessary editorial amendments in that manuscript to suit journal’s format. Papers are accepted purely on the basis of merit. The Journal reserves the right to reject or publish the research paper. Rather than Rejection, we believe in Revision. Our first priority will be to covert ordinary content in to quality content by suggesting revisions. The corresponding or submitting author submits the paper to the journal via e-mail : mail@shabdbraham.com, mail@shabd-braham.com or prof.pushpendra@gmail.com. The journal checks the paper’s composition and arrangement against the journal’s Author Guidelines to make sure it includes the required sections and stylizations. The EIC checks that the paper is appropriate for the journal and is sufficiently original and interesting. If not, the paper may be rejected without being reviewed any further. The quality of the paper is assessed at this point. If paper is original, the research paper is send to Reviewers. The reviewer sets time aside to read the paper. The first read is used to form an initial impression of the work. If major problems are found at this stage, the reviewer may feel comfortable rejecting the paper without further work. Otherwise they will read the paper several times. 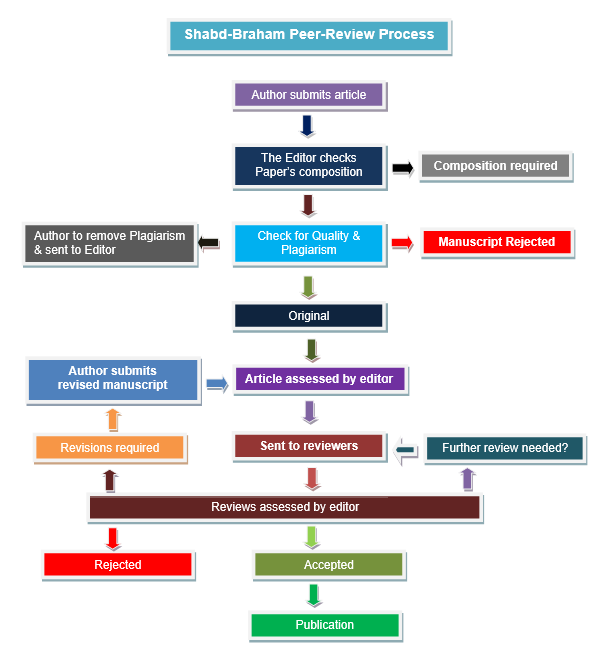 The review is then submitted to the journal, with a recommendation to accept or reject it – or else with a request for revision (usually flagged as either major or minor) before it is reconsidered. The Chief-Editor considers all the returned reviews before making an overall decision. If the reviews differ widely, the editor may invite an additional reviewer so as to get an extra opinion before making a decision. The editor sends a decision by email to the author including any relevant reviewer comments. Whether the comments are anonymous or not will depend on the type of peer review that the journal operates. If accepted, the paper is sent to online publication. If the article is rejected or sent back for either major or minor revision, the editor include constructive comments from the reviewers to help the author improve the article. At this point, reviewers should also be sent an email or letter letting them know the outcome of their review. If the paper was sent back for revision, the reviewers should expect to receive a new version, unless they have opted out of further participation. However, where only minor changes were requested this follow-up review might be done by the editor. To improve the manuscript whenever possible. To check against malfeasance/dishonesty within the research community. Provide editors with evidence to make judgments as to whether articles meet the selection criteria for their particular publication. The main functions of the peer review process are to help maintain standards and ensure that the reporting of research work is as truthful and accurate as possible.